HDAC9 from other species may also be detectable. 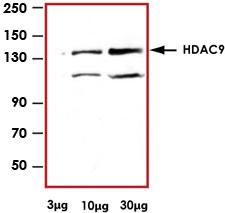 Sample Data :Representative western blot (1:1000) with Anti-HDAC9 using 3 µg, 10 µg, 30µg of 293T cell lysate. Scientific Background :Acetylation of the histone tail causes chromatin to adopt an “open” conformation, allowing trans factors increased accessibility to DNA. The identification of histone acetyltransferases (HATs) and their large multiprotein complexes has yielded important insights into how these enzymes regulate transcription (1,2). HAT complexes interact with sequence-specific activator proteins to target specific genes. In addition to histones, HATs can acetylate non-histone proteins, suggesting multiple roles for these enzymes (3). In contrast, histone deacetylation promotes a “closed” chromatin conformation and typically leads to repression of gene activity (4). Mammalian histone deacetylases can be divided into three classes on the basis of their similarity to various yeast deacetylases (5). Class I (HDACs 1, 2, 3 and 8) proteins are related to the yeast Rpd3-like proteins, those in class II (HDACs 4, 5, 6, 7, 9 and 10) are related to yeast Hda1-like proteins and class III proteins are related to the yeast protein Sir2. Inhibitors of HDAC activity are now being explored as potential therapeutic cancer agents (6,7). 1. Marmorstein, R. et al. (2001) Cell. Mol. Life Sci. 58, 693–703. 2. Gregory, P.D. et al. (2001) Exp. Cell Res. 265, 1105–202. 3. Liu, Y. et al. (2000) Mol. Cell. Biol. 20, 5540–5543. 4. Cress, S.D. and Seto, E. (2000) J. Cell. Physiol. 184, 1–16. 5. Gray, S.G. and Ekstrom, T.J. (2001) Exp. Cell Res. 262, 75–83. 6. Thiagalingam, S. et al. (2003) Ann. N. Y. Acad. Sci. 983, 84–100. 7. Viguishin, D.M. and Coombes, R.C. (2004) Curr. Cancer Drug Targets 4, 205–218.